In Zoho Analytics you can join tables to create reports using one of the following two methods. When you want to create reports using data spanning across multiple tables, Zoho Analytics provides you with a special feature called Auto-Join. This feature automatically joins tables when creating reports, if the tables are connected using a Lookup column. For this feature to work, you need to specify that two tables are related using the Lookup column. To define a lookup relationship between two tables, it is essential that the tables have at least one column which is common between them. Let's look at this further with an example. Given these related columns, we can define lookup relationship between Sales and Sales Person table through the column Sales Person ID. Similarly, between Sales and Product Details tables a lookup relationship can be established based on the common column Product_ID. Once the lookup column relationship is defined Zoho Analytics will automatically join data from these tables using the Auto-join feature when you start creating reports based on these tables. You can define lookup form your existing table or while importing. You can also define a lookup from the report editor. The following section explains how to define lookup between tables. This section explains how the lookup relationship is defined from tables. Let's assumed that we have a Store Sales Workspace with the tables as described in the above section. Let's start defining lookup between Sales and Sales Person tables through the common column Sales Person ID. Open Sales table and click Edit Design button. Select the Sales Person ID column. Right-click the column header and select Change to Lookup Column. In the Change to Lookup Column dialog that opens, select the Sales Person ID column to look up. Similarly, we can define the lookup relationship between Sales and Product Details table using the Product ID column. Here the lookup column is defined for the Sales table (child table), with Product Details table which is the parent. Zoho Analytics auto identifies similar columns and provides suggestions for lookup while importing. The following presentation explains how this works. Zoho Analytics allows you to join tables from the report editor when you need to include data from another table. This following presentation explains how to include another table's data for reporting. Once tables are related with each other using lookup columns, you can create the reports by selecting any of table with lookup relationship. Zoho Analytics will automatically join the data from these tables and generate the report, when you drag and drop columns from across tables. You can link multiple tables using various Lookup columns in your Workspace. When creating a report, Zoho Analytics will use the appropriate Lookup columns (Lookup path) created between them and generate the report using the auto join capability. However, in some cases this might not suit your specific need. To address this, Zoho Analytics allows you to choose the Lookup path between tables to be used for report creation using the Configure Lookup Path option. In the above-given model, let's see an example of creating the report Bugs Identified by User. By default, when you plot a report for Bugs identified by each user, Zoho Analytics could use the Assignee ID lookup to Users table which is not correct as it will provide Bugs assigned to each user. In this case, you can change this by selecting the Reporter ID as the Lookup Column to be used. The following illustration shows how to change the Lookup Column to join. You can also select multiple lookup columns between each pair of tables in a path. This allows you to create report over data that meet multiple conditions. Let's say you want to create reports on bugs where both the assignee and the reporter are same users. You can do this by selecting both the Assignee ID and the Reporter ID as lookup columns. The following illustration shows how to select both lookup column for joining. Zoho Analytics also allows you to change the lookup path that joins the tables. Let's say, you need a report on Bugs raised on Projects categorized by owners. Since the Bugs and the Users are directly joined tables, Zoho Analytics will generate the report as Bugs assigned for Users categorized by Projects. 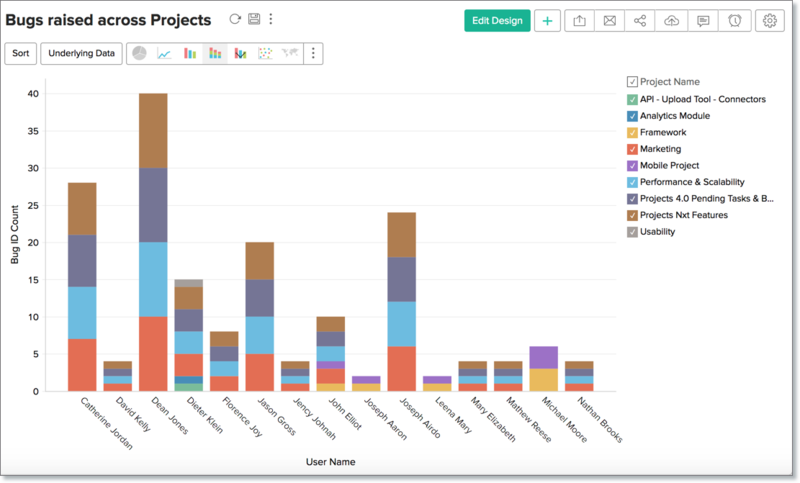 It will ignore the Projects table in-between to generate the reports. To achieve your requirement, you can join the Bugs and the Users tables through the Projects table. 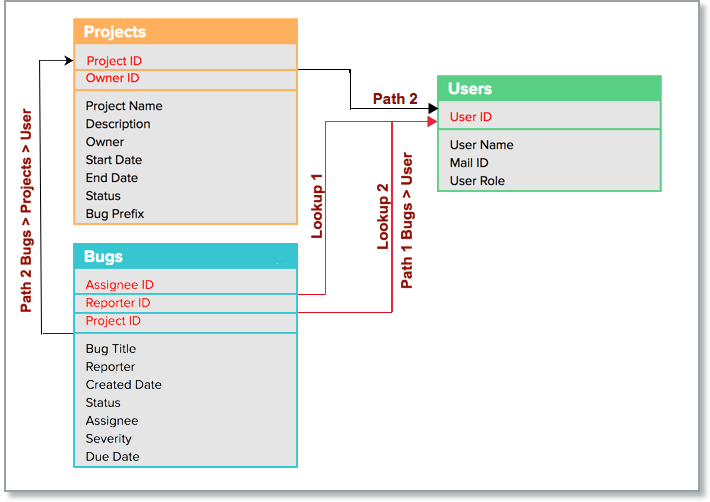 The following illustration shows how to change the Lookup Path to join tables. Note: You could only configure a single path to connect two tables. You cannot configure different paths for two columns from the same table in the report. However, you can configure different paths for columns from the different tables. You can create Query Tables for filtering datasets, batching datasets together (union), transforming data, applying SQL query functions, joining data and more. 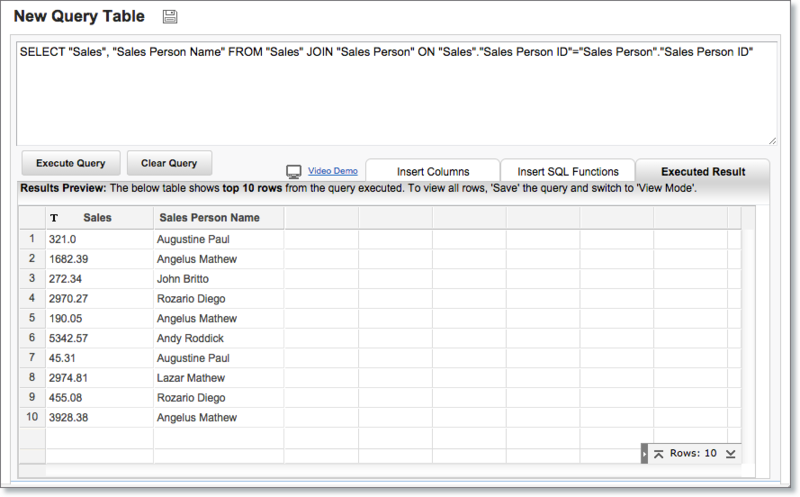 The example query above joins the Sales & Sales Person tables. Once you create query table joining the necessary tables, then Zoho Analytics allows you to create any type of reports for analysis and visualization over the same.